Vancouver and British Columbia have a long, rich history when it comes to natural resources and economic development – fisheries, mining and timber in particular. The capital city and province likewise have emerged as hubs for grass roots political movements and efforts to scale up use of local renewable energy resources and actions to mitigate and adapt to climate change. Renewable microgrids are playing a growing role in this regard. The valuable energy services these new distributed energy resource management platforms can play in the event of grid outages became apparent at the British Columbia Institute of Technology (BCIT) recently. 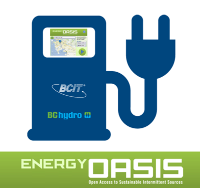 BC Hydro grid power was lost on Sept. 14 while BCIT was demonstrating its new solar-powered electric vehicle (EV) charging station, according to a Business Vancouver news report. Part and parcel of BCIT’s mini grid, the Energy Oasis solar-EV charging platform was able to power the PA system and other electronics that were being used during a press conference. Serving as an on-site, emergency back-up power supply wasn’t what the Energy Oasis platform was primarily designed for, but it served as one during the grid outage. 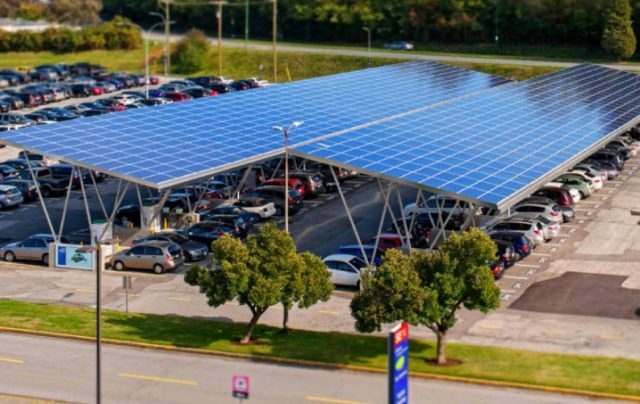 Referred to as the ¨gas station of the future,¨ BCIT’s Energy Oasis is comprised of an array of 84 pole-mounted PV solar panels that overhang spaces in the college’s parking lot. All told, they can produce up to 250 kWh of local, emissions-free electricity per day, enough to power 30 homes, BCIT ‘s director of smart grid research Hassan Farhangi explained to Vancouver Business reporter Nelson Bennett. The panels are linked to a state of the art energy storage and management system comprised of lithium-ion batteries and two fast and four slow EV charging stations. The former can charge an EV’s battery in 10-20 minutes, while the latter can do so from 4-6 hours on average. Key to the system’s effectiveness are system operating controls that include load balancing features. The Energy Oasis platform was built as a demonstration project with funding provided by public and private sources – $4.4 million from Natural Resource Canada and $2 million from BC Hydro, Bennett reports. Siemens, Schneider Electric, Panasonic and Car2Go also provided financial and in-kind support for the cutting edge project. “The intention behind this particular subsystem is to try and develop a footprint for the gas stations of the future, or charging stations for electric cars,” Farhangi said. Energy Oasis is the latest facet of a larger publicly funded demonstration project – a microgrid that BCIT initially started developing in 2007 that will enable the college to be completely energy self-sufficient. Some C$30 million has been invested in BCIT’s microgrid project to date. In addition to the Energy Oasis solar-EV platform, BCIT has built a net-zero demonstration home that is able to generate and supply all the power it needs. Rooftop PV solar panels and a small-scale wind turbine provide the electricity generation capacity. In total, BCIT’s microgrid generates nearly 1 kWh per day of emissions-free electricity, about 1/6 of its average overall electricity load. In addition to its main use – charging EVs – surplus power also is stored for sale to BC Hydro for grid power. And as events at the public Energy Oasis demonstration highlighted, it can serve as an effective source of on-site back-up power in emergencies as well.